So what’s the deal with the ‘bullet-proof’ craze? Bulletproof Coffee is a branded coffee drink consisting of “upgraded” black coffee blended with grass-fed butter and “Brain Octane oil”, an 8-carbon fraction of medium-chain triglyceride oil. The recipe was created by Dave Asprey and first posted to his blog in 2009. Asprey claims that the drink boosts cognitive performance and weight loss, and it has been consumed by sportspeople and Silicon Valley entrepreneurs. 1. My brain feels sharper. 2. My energy levels are higher- Not like taking a pre-workout but better and sharper than coffee. 3. My concentration at work is improved. 4. It’s a super pre-workout for a tough session. 5. It’s a great way to sneak good fats into my diet! 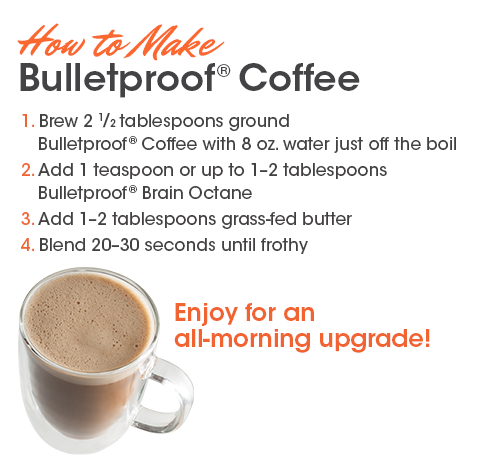 How do you make Bulletproof coffee? I *may have sneakily stolen this from google images from the bulletproof coffee site- guilty as charged your honour- see the recipe below, from the horse’s mouth! How often do you drink Bulletproof coffee? I have it most mornings now- in place of my usual shop-bough coffee which is close to 4 euro now- so making my own is healthier, cleaner and I know the quality of the product I am using. Where do I buy Bulletproof coffee? I buy the coffee, the oil and the collagen protein (I add the tasteless protein to my own whey mix post-workout!) from this site and they now deliver to Ireland- YAY!